This Eldorado Canyon wedding package includes all your Eldorado Canyon permits, professional photographer, Wedding Officiant, limousine transportation, 100 minimum digital images on USB with photo rights belonging to you. On this wedding package, you may have up to 6 additional guests (not including the wedding couple) at no additional charge! After pickup from your Las Vegas hotel, you'll enjoy a beautiful 1 hour ride to the Eldorado Canyon Ghost Town. 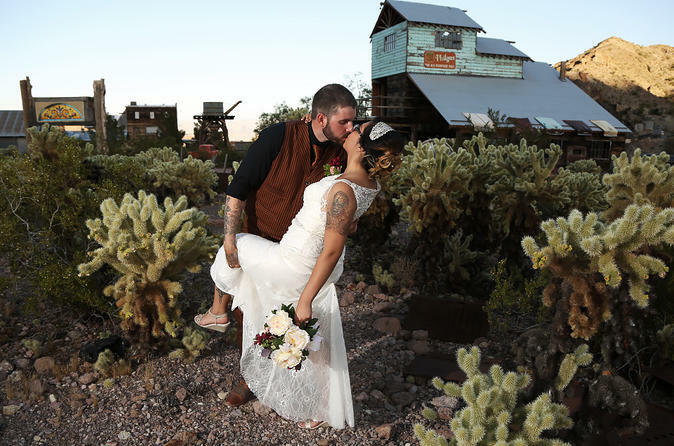 Once there you'll have about an hour for your wedding ceremony and photo shoot before returning back to Las Vegas. You will arrive to the Ghost Town and meet your photographer and non-denominational Wedding Officiant. Your ceremony will take place shortly after arrival and then you will take posed photos after your ceremony. You can choose to either have a civil or religious ceremony. You are more than welcome to have up to six guests (not including the wedding couple) at no additional charge. All guests must also be at the same limo pickup location as the wedding couple. A professional photographer, ghost town entrance fees/permits, Wedding Officiant, limousine transportation and a minimum of 100 digital images on USB with non-commercial photo rights belonging to you are included.